One morning in Sri Lanka. I happened to get up early, and wandered out of the hotel to see what was going on. 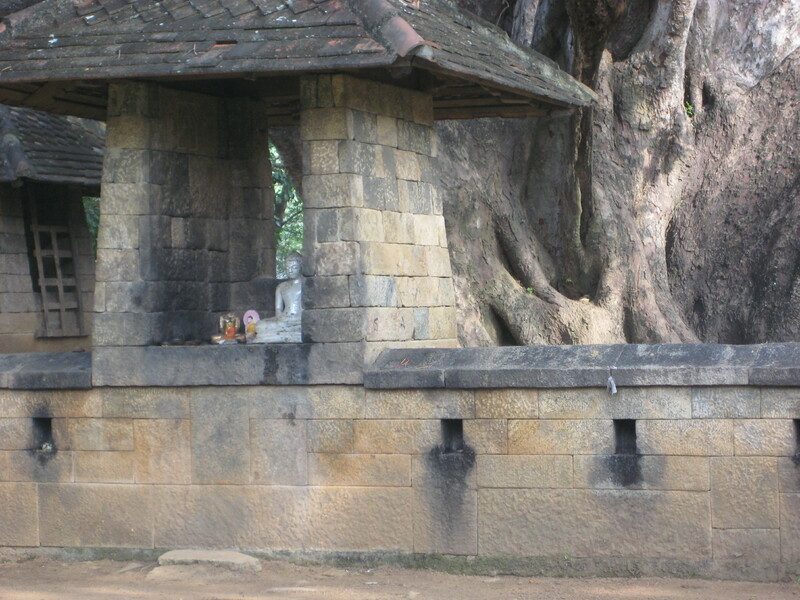 It was in the small city of Dambulla, and our hotel was a few hundred yards away from the main road. At the crossroads, I came across what I at first thought was a park of some sort. Then I realized it was a temple. 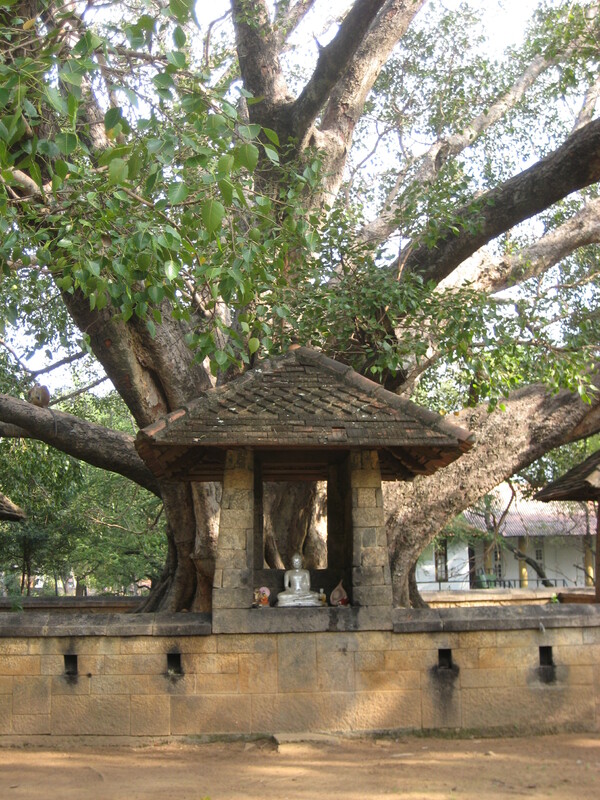 And the heart of the temple was a tree. 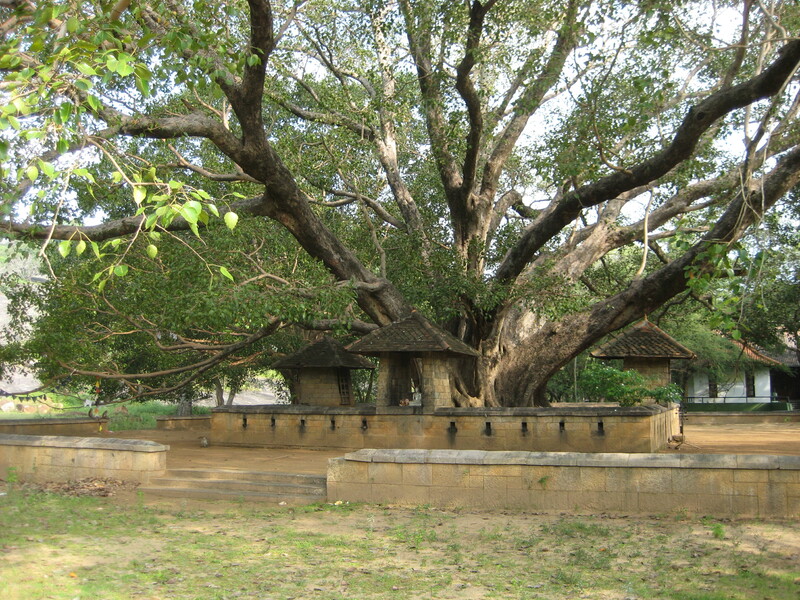 A magnificent tree, an ancient tree. A double set of temple walls surrounded and protected it. You have to take off your shoes to approach the holy tree. The temple is right in the mainstream of life, a few feet away from honking cars, snorting buses, and the zipping, tooting three-wheeled taxicabs called tuk-tuks. Morning commuters stop by on their way to catch the bus. They light a hurried stick of incense, or leave a flower in front of the small Buddha statues. Someone–a groundskeeper? A priest? was silently raking the dirt floor clear of twigs and leaves. The tree, like all trees, is filled with life. Leaves moves and rustle in the morning breeze. Birds flitter in the top branches. Every now and then the big branches move wildly, as if the tree was waving giant arms. The monkeys are here. 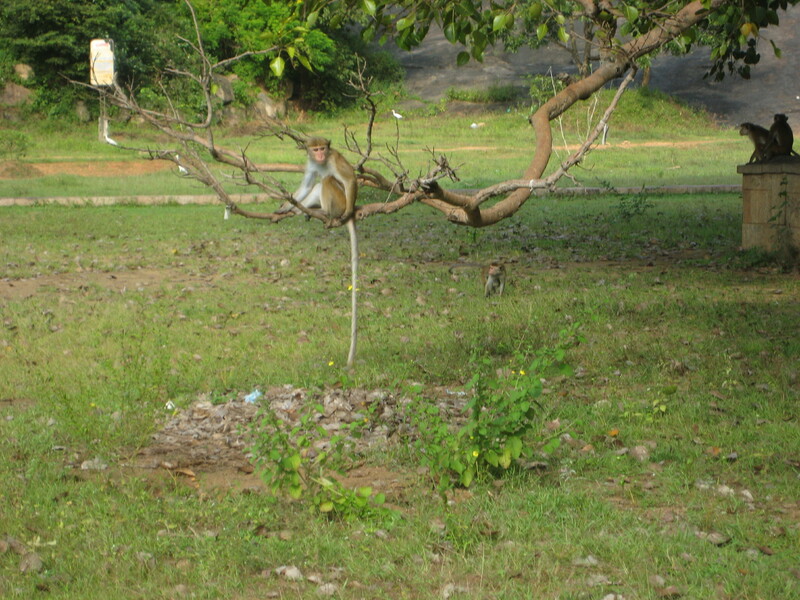 The monkeys crash through the branches and leap down onto the flat-topped temple walls. They skitter along the walls, and swing on the prayer flags. I expected the priest to wave his rake and scare them away, but he scattered some shredded coconut on the temple wall to welcome the monkeys. They say Buddha found enlightenment under a tree, and I can see why. I’ve never been in a church that was so alive.